Marquise cut engagement rings feature a unique, curved oblong shape that flatters almost every finger shape. Dating back to the 18th Century, the shape is thought to have originated in the court of King Louis XV of France, who is said to have commissioned a diamond shape that resembled the lips of his mistress, Jean Antoinette Poisson, the Marchioness Madame de Pompadour. This cut is also known as the navette ('little boat'). While not quite as popular as round or princess cuts, this cut has a classic look that will never date. 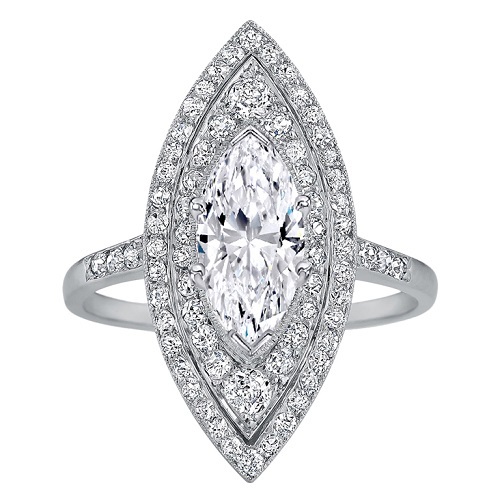 What makes the marquise cut so beautiful is its ability to sparkle, and its distinctive, flattering shape. The cut features 56 facets, with pointed ends. Whether set vertically or horizontally, engagement rings featuring this cut have a classically feminine appeal that can be rather versatile depending on the setting, stone and metal. Pave remains a popular choice for just about every ring style and diamond cut. 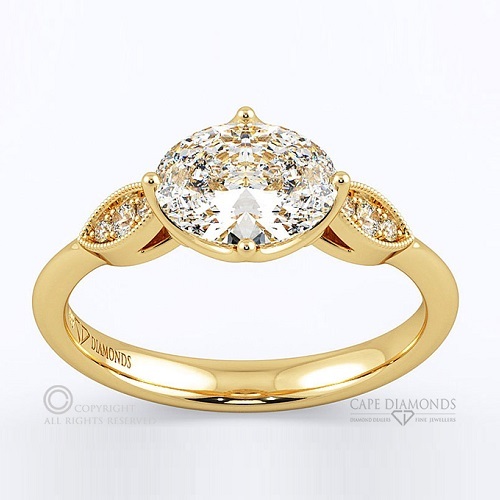 With the marquise cut, tiny pave stones that surround the centre stone can be done in a halo style or in a subtle style that only includes the band. Depending on your budget and preferences, the final result can be beautiful and bold, or minimal and understated. This style works well in platinum and cool toned metals as well as golds and coloured diamonds. For brides that favour a more unconventional ring, retro inspired rings work well with the marquise cut. In this example, the eye shape of the stone is enhanced by clustered stones, creating an unusual design that has plenty of art deco loveliness. Choose two different stones to create balance, such as diamonds and sapphires as pictured here, or stick with one stone for a more subtle effect. One thing to note with this type of ring however – the clusters may catch easily. If you work with your hands or have an active life, you may need to remove your ring when doing any activity that may lead to tangles or damage to the stones. Minimal engagement rings remain an excellent choice for brides who are not huge jewellery wearers. 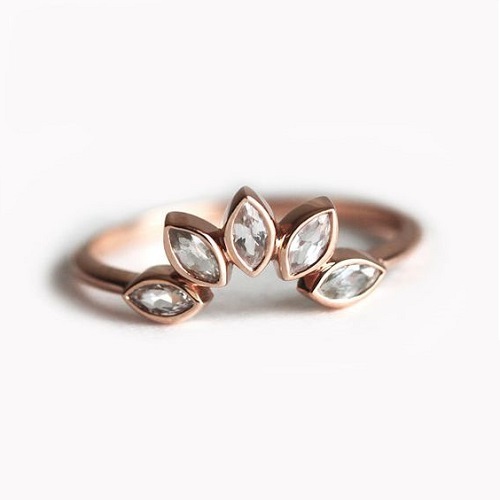 The marquise has the ability to be both bold and unadorned, making this cut perfect for a very understated minimal ring. Choose a single metal and a smaller sized stone that is set into the band. Platinum and diamonds work well with this design, but you could also opt for rose gold, yellow gold and a coloured stone such as morganite or tanzanite. For romantics at heart, a twisted band is always a good choice. 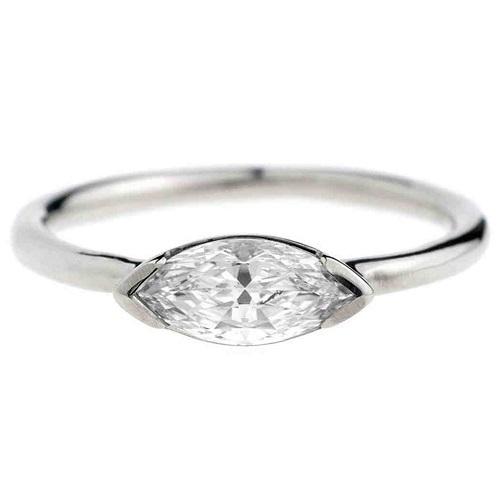 The delicate detail on this band helps to position the centre stone without overpowering it. White gold makes a feminine, romantic metal for this style, but you could choose any other metal that will work equally well. The stone can be positioned vertically or horizontally, while detail can be added in the form of two toned metal or tiny pave stones on the band. 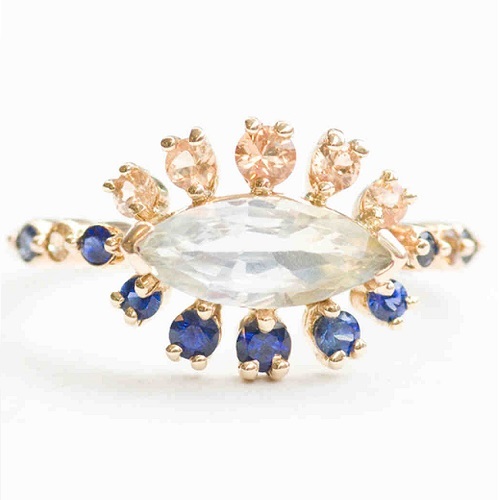 Bohemian brides will adore the simple yet pretty detail of the crown ring. 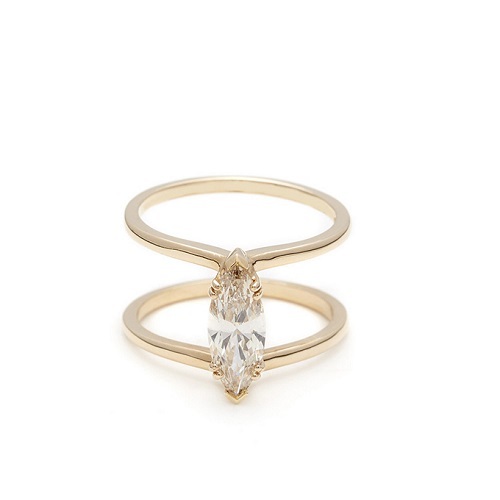 This ring has a vintage feel, which works especially well with the perfectly balanced cut of the marquise stone. This style is also known as a fan and, depending on the metal and setting, it can be simple or ornate. If you are seeking a truly bold ring, you could even alternate the stone colours with black and white diamonds, set against yellow gold or rose gold for something unique. The double band is flattering, especially for brides with longer fingers. The two bands are typically delicate and thin, with the centre stone sitting between the bands. The marquise cut works very well for this style, creating flawless symmetry. Choose a soft gold and diamond combination, or opt for a coloured stone in a cool toned band. 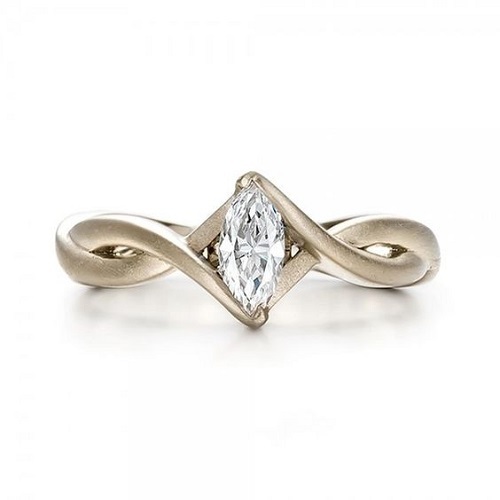 Last, but not least, you don't have to feature marquise stones as the primary design element in your ring. You can also use these stones to showcase a round or oval centre stone. When acting as side stones, this cut creates a gentle balance that is symmetrical and simple. This makes them ideal for three stone engagement rings. Looking for more inspiration for your dream ring? Cape Diamonds boasts a unique selection of hand crafted engagement rings, and also offers a bespoke ring design service that allows you to create your ring from scratch. Contact us today to learn more about custom engagement ring design in Cape Town.